From November 18 to 20, 2018 the 16th meeting of the bilateral commission of the Delegations of the Great Rabbinate of Israel and of the Holy See Commission for religious relations with Judaism took place in Rome on the theme: The dignity of the human being: teachings of Judaism and Catholicism regarding children. 1. Cardinal Peter Turkson as chair of the Catholic delegation welcomed the Jewish partners to Rome invoking Divine blessing on the deliberations. Rabbi Rasson Arusi responded expressing the joy and satisfaction of the Jewish delegation to be reunited in this joint holy endeavor and quoted in prayer Psalm 90:17, “may the favor of the Lord our God rest on us and establish the work of our hands for us”. 3. The Commission noted the significant advance in modern society regarding the subject of human rights as evidenced in the Universal Declaration on Human Rights and in particular the 1989 Convention on the Rights of the Child. These principles of the inviolability of human life and the inalienability of human dignity find their full expression in relationships between the individual and the Divine and the individual and his/her neighbor; with responsibility to provide for such expression throughout society. We have a special obligation towards the more vulnerable members of our communities and in particular towards children, the guarantors of posterity, who are not yet able to express their full potential and to protect themselves. 5. Respect for the personal dignity of children must also take the form of offering the widest range of stimuli and instruments to develop their reflective and operative capacities. Not only is it necessary that children perceive themselves to be the object of appropriate and loving attention, but also that they be dynamically engaged in such a way that their cognitive and practical capabilities are stimulated. In order for this development to take place in consonance with the aforementioned values, it is necessary to nurture authentic and stable loving relationships and provide for adequate nutrition, healthcare, and protection, as well as the necessary religious education, schooling, informal learning, and creativity. 7. 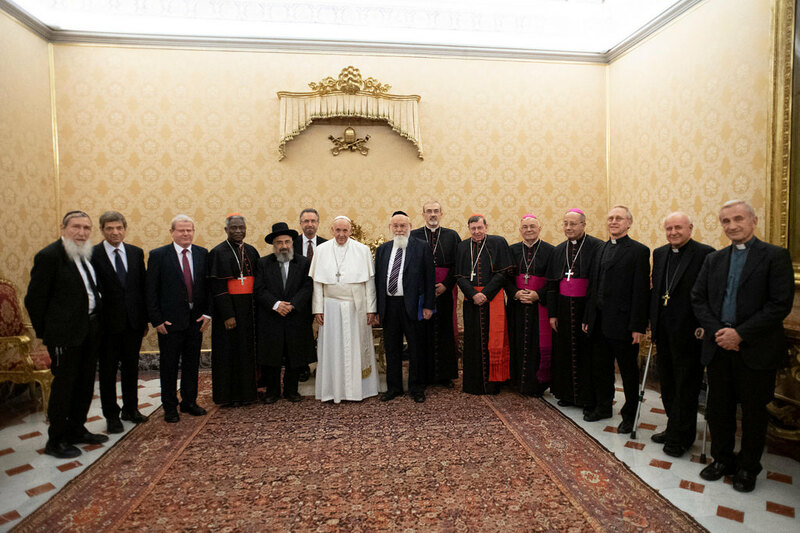 The members of the Bilateral Commission were hosted by Pope Francis at a special audience where he affirmed his own commitment to their work and the advancement of Catholic-Jewish relations: “We are brothers and the children of One God, and we must work together for peace hand in hand”, he said. At this meeting, the Pope welcomed the information provided to him regarding a draft interreligious position-paper on end-of-life matters with particular reference to the dangers of legalizing euthanasia and physician-assisted suicide instead of providing palliative care and maximal respect for God-given life. 8. Concluding their deliberations, the members of the Bilateral Commission gave thanks to the Almighty for His blessings upon their lives and work; and for His gifts, not least of these being children themselves, who are described thus in Psalm 127:3, “Children are a gift from the Lord, the reward of the fruit of the womb.” To ensure their healthy spiritual development, it is particularly important to familiarize them with the Biblical patrimony that both Jews and Catholics share. 9. Furthermore, the Commission urges that these texts of Holy Scripture should be studied throughout their respective communities. In addition, the teaching of Nostra Aetate (n. 4) and subsequent documents pertaining to Jewish-Christian relations, should be widely known and disseminated throughout both communities, providing impetus for the ongoing blessed reconciliation and cooperation between Jews and Catholics for the betterment of their faithful and society as a whole.